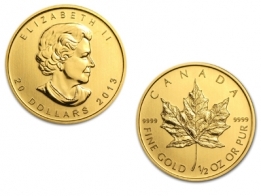 1/4 Ounce Canadian Maple Leaf Gold Coin .9999 Fine. 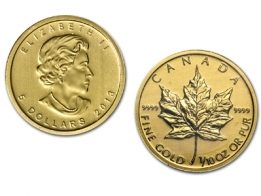 Each 1/4 ounce Gold Maple Leaf Coin has a face value of $10 CAD. The coin features an image of Queen Elizabeth II on the front, and the image of a Canadian Maple Leaf on the reverse. The coin's weight, fineness, year of minting and face value are also located on it. 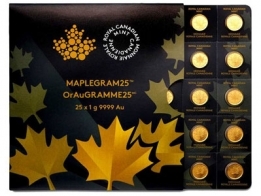 The Canadian Maple Leaf series is the most popular series produced by the Royal Canadian Mint. The coin comes in 1/10 oz, 1/4 oz, 1/2 oz, and 1 oz sizes in gold. The Canadian Maple Leaf is also available in 1 Oz in silver, platinum and palladium. 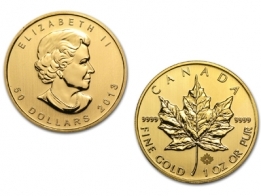 The Canadian Maple Leaf series is very popular with gold and silver investors as they have a low premium and are recognised worldwide. Wholesale gold Maples are also available.